• Saying “yes” to request for quotes on large parts, with little concern given to having limited die space that might force the addition of secondary operations. This 800-ton Minster press at Pax Machine Works, outfitted in 2008 with a Wayne Trail through-the-window servo-transfer system, runs coil-fed transfer jobs more than 80 percent of the time over two shifts of production. Changeover from transfer to progressive mode, using quick-change transfer-tooling bars, takes just a few minutes. Having focused for more than 50 yr. on progressive-die work at its 23-press 326,000-sq.-ft. facility in Celina, OH, an expansion of its customer base and in the types of projects it had begun to quote facilitated the move, in 2008, into transfer stamping. Pax has a long-standing history supplying stampings for a couple of key automotive applications—oil-filter parts and engine and transmission mounts—that prove ideal for progressive dies. And it has the press capacity to handle huge volumes—two 1200-ton presses (204 by 54-in. bed), two 1000-ton presses (168 by 54-in. bed), two 800-ton presses, six 600-ton presses, and a slew of presses from 100- to 400-ton capacity. Why the Move to Transfer? “As customer requirements evolve, so must we,” summarizes Pax project engineer Brent Harman. Defining further how customer needs have changed, Harman points to two common trends in the automotive industry —the move toward aluminum and higher strength steels, and the seemingly never-ending increase in part complexity. “With these new materials,” Harman explains, “it’s getting more and more difficult to produce the parts completely in a prog die without requiring secondary operations. Prior to adding our transfer capabilities, in some cases we would have to ‘no-quote’ projects. Finally, one project in particular caused Pax to take the leap into transfer—a driver-side airbag inflator produced from 90-ksi steel. With a relatively deep 27-mm draw, the parts couldn’t reliably be stamped in a progressive die, Harman says. The one project that finally convinced Pax to take the leap into transfer: these driver-side airbag inflator stampings. With a relatively deep 27-mm draw, the parts could not reliably be stamped in a progressive die. Parts are of 90-ksi yield-strength steel 0.114- to 0.129-in. thick, stamped from 12.5-in.-wide strip. That’s when Pax ultimately took the leap and installed an all-servo transfer system, retrofitted in 2008 to one of its 800-ton presses. The transfer, from Wayne Trail, runs coil-fed through the press window, allowing the press to still run in progressive mode when needed. “We run that press in transfer mode more than 80 percent of the time, near 50 strokes/min.,” Harman says, noting that the airbag inflator stampings (0.114- to 0.129-in.-thick 90-ksi-yield steel, 12.5-in.-wide strip) take up the majority of the press time. Also running in the transfer mode on the press are 0.079-in.-thick motor housing stampings. Since its initial foray into transfer stamping, Pax has been able to take on a growing percentage of transfer work. It’s got seven transfer tools inhouse that stamp 12 different part numbers. 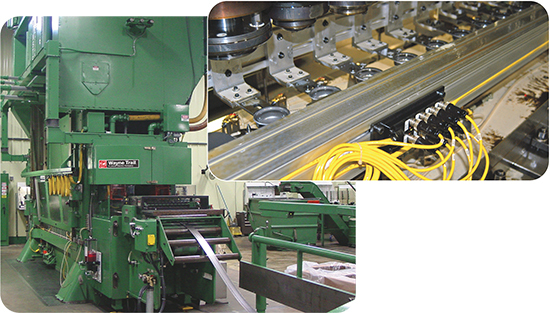 To keep up with the opportunities to quote transfer work, in 2012 Pax outfitted one of its 1000-ton prog-die presses with another Wayne Trail through-the-window transfer system. And, a third transfer-equipped press (600 ton) will land on the pressroom floor in March 2015. While flexibility and the ability to take on different types of stampings are clear benefits to adding transfer capabilities, Harman also notes the material savings the firm is realizing when running transfer work—and not just from eliminating the carrier strip of progressive dies. “Space restrictions prevent us from using a zig-zag feeder to nest our blanks prior to the first transfer station,” he explains. “Wayne Trail equipped the system to allow us to gag the punches. By nesting our round blanks two-up, we can improve material utilization by 7 to 8 percent; with a three-up nest, we reduce material use by 11 to 13 percent. Explaining how that technology plays out in production, Harman describes a job run with a single transfer bar gripping parts from only one side. The process employs pneumatic finger tooling. “This enables the part (a 6- by 8-in. seatbelt component) to tip in the press to position it perpendicular to the tooling,” says Harman. “The part runs through four operations—piercing, extruding, chamfering and piercing again—and if we couldn’t tip it we’d need cams in all four stations. This allowed us to simplify the tooling. See also: Nidec Minster Corporation, Wayne Trail - A Lincoln Electric Co.